Bisecting an angle with straightedge and compass. Click here to see an animation of the construction. One of the most famous mathematical problems of antiquity was to divide an angle into three equal parts using just a straightedge (a ruler without markings) and a compass. It's easy to divide an angle into two equal halves using those two tools (see the picture on the right or read this article). But is there a similar construction that guarantees to divide any angle into three? People tried to find one for over two millennia, until the French mathematician Pierre Wantzel showed in 1837 that you can't do it — there is no way you can trisect an angle drawn on a flat piece of paper using only a straightedge and a compass. In this article we'll show that the problem becomes possible if you allow yourself to make use of the third dimension. The idea is inspired by woodwork and carpentry. For centuries journeymen carpenters rarely enjoyed the benefit of formal schooling, and many were illiterate. Yet geometry is at the heart of their profession. So they developed thousands of tricks and shortcuts to lay out a project without resorting to maths. The brown rectangle represents the board. 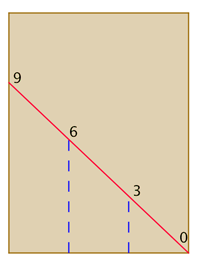 The red line represents the ruler, which has been placed so it measures a length easily divisible by 3 (9 in this case). The dashed blue lines then give the lines that divide the board into three equal planks. In woodworking dimensions are often transferred from one surface to another by scribing. For example, to align a dove tail joint around a drawer corner, the front and sides are clamped together and the layout lines are scribed through — no measuring, no chance for numerical error. Similarly, before turning on a lathe, profile shapes are transferred from the lumber's edge to the faces of a nascent table leg. So I wondered if a similar trick could be used to divide an angle into three equal sections with just a compass and a straightedge using the third dimension. Often, moving to a higher dimension simplifies a problem. Can you draw a circle with only a straightedge? 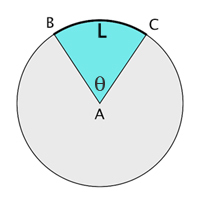 Not on a flat plane, but on the surface of a sphere, a straight line eventually returns to itself, forming a circle of longitude. No compass required! 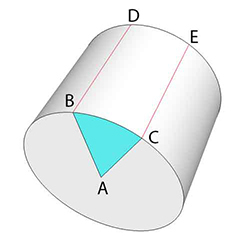 As it turns out, moving from the plane to the surface of a cylinder converts dividing an angle into three parts with a compass and straightedge into simply dividing a rectangle into three "boards". The straightedge alone suffices, and the intersection with carpentry tricks is a tight fit. 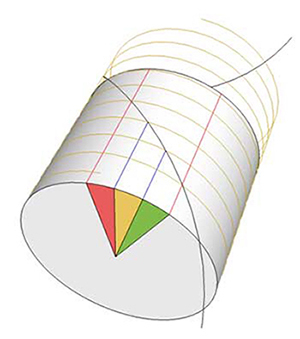 Step 1: First, draw the angle to be trisected ( ) centred on the face of a cylinder. 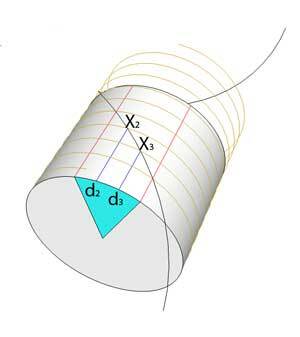 Then project the ends of the angle along the length of they cylinder. These two lines, and , are straight and parallel and aligned with the long axis of the cylinder. You can produce these lines using a flexible straightedge, one that can bend around the edge of the cylinder’s face. 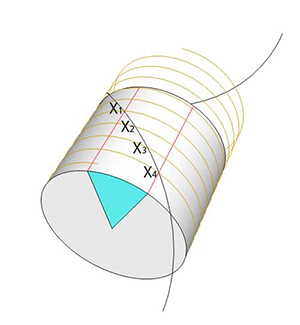 If you place such a straightedge on the circular face of the cylinder so that is passes through the centre point and then bend it around the face’s edge onto the surface of the cylinder, then the line produced on the surface will be perpendicular to the face and therefore parallel to the axis. That is, a straight line on a sphere forms a circle, a straight line on the cylinder from A to D creates a 90 degree bend through B, at least to our three-dimensional eyes. Step 2: Now, wrap a flexible straightedge around the cylinder, forming a helical path with equal distance between its windings. You can do this by ensuring there’s no gap between windings of the straightedge, so each turn butts against the previous. Then trace the edge of the strip as you unwind it from the cylinder. 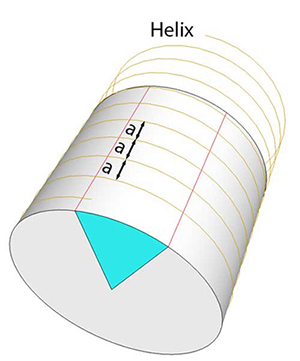 Interestingly, helices are the paths of shortest distance on a cylinder: if you were to pick two points on the cylinder that don’t lie along a line that is parallel to its axis, then the shortest path between them is part of a helix. So helices are the equivalent to straight lines on the plane. We write for the helical "pitch" of the spiral. Step 4: Drop a line from and to the front face, intersecting the perimeter of that face at and The two lines are parallel to the cylinder axis and the red lines (you construct them as it step 1). Finally draw a radius from the point where and touch the perimeter of the cylinder face to the centre of the face. 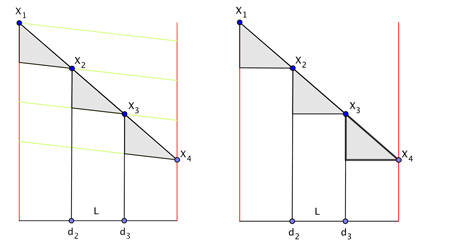 The original angle is trisected exactly, using only a (flexible) straightedge. Now imagine the cylinder being made of a rolled-up piece of paper. Imagine flattening that piece of paper and considering the rectangle bounded by the arc and the two parallel red lines (which contains the points , , and ). The black line and the green lines together form three triangles, shown shaded grey in the left-hand figure below. Since the green lines are parallel and equally-spaced, those three triangles are congruent. This means that their longest sides all have the same length — which means that the diagonal black line (coming from the second helix from step 3 above) is divided into three equal segments by and . You can convince yourself that this implies that the shaded triangles on the right in the figure below are also congruent. 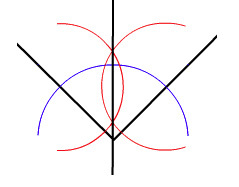 This means that their horizontal sides all have the same length, which in turn means that the blue lines divide the arc into three equal segments, as required. Why doesn't it work in the plane? Is there a way of projecting this set-up onto two dimensions and come up with a straightedge and compass construction to trisect the angle in the plane? The answer, you won’t be surprised to hear, is no. Our construction above only worked because the line segment was allowed to double up as an arc of a circle on the one hand and the edge of a flat rectangle on the other. This was only possible because we were allowed to roll a flat piece of paper up to form a cylinder — which requires the third dimension. However, while playing with this construction I came up with some approximate methods for trisecting an angle in the plane. You can find out more on my website. 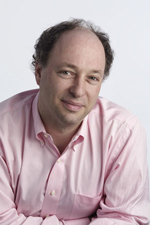 Greg Blonder is a Professor of Manufacturing and Product design at Boston University, and formerly the Chief Technical Advisor at AT&T and a research VP at Bell Labs. His favourite book as a child was The World of Mathematics by J.R. Newman. Trisecting an angle using the 3rd. dimension. Thank you very much sir for the lucid explanation. It is wonderful. I loved it.